Open that tin or bag if you have both? So you have a favored blend where you are laying down a significant amount. And you have both 2 oz tins and 8 oz bags. When it is time to open the next Tin/Bag, is there any preference to open one or the other? Bags for me too and then it goes in jars for the long haul. So let’s say you started laying down a Blend in 2014. It is your favorite, so you have acquired a significant amount. You have some from each of the ensuing years. Once you run out of bags from 2014, would you begin to open bags from 2015 or tins from 2014? Your sealed tins are good for...ever. I happen to know the blend of which you speak and people have had trouble with pin-holes in those bags (*I havent, I put them away and don't mess with them, but others have). I have also seen people post that they had trouble with the older square tins losing their seal but again - a non-issue for me so far. If you're concerned about anything it should probably be the bags. Jar them up if they're unsettling you. Or just leave them hidden in that one secret box and move them as little as possible. Another option is to push the burden onto a good friend who lives in the woods and will hardly smoke any of your stash. If you're concerned about anything it should probably be the bags. Jar them up if they're unsettling you. Or just leave them hidden in that one secrert box and move them as little as possible. Hey Spillproof...do you think any of your neighbors would be willing to do that for me? Bag, then break it out into 4 jars. That’s what I would do. Right now I have tins and bags of hard to find stuff. My plan is to open the tins and try it first before jumping into the bags. That way I can trade the sealed bags if I don't care for them. I have been primarily an aromatic smoker and in the last year started branching out. Still trying to figure out what I like and might not like but so far I have liked everything new I have tried. I too have 8oz bags of a favorite, hard to find blend (Mesoterica Pilsbury, very obscure 😀). The oldest bag I’ve opened was at the 4 year mark and it was fine. That said, I do worry about the possibility of pinhole type issues so I always jar newly acquired bags but I’m never in a big hurry to do so. Usually a new bag sits around for a month or two at least before I get around to the jars. Once the bags have been jarred, I open the oldest jar or tin on hand to smoke. Lesson of the thread - don’t fondle your bags often, or they’ll leak. reeeal mature 😔..... Looks like someone's gonna have to work on their technique. away and opened and jarred a bag. I appreciate your thinking of me sir! Yah, I can store stuff for y'all with the totes of whole leaf. That first diagram is just plain silly. His zipper, (for doing his business), would have to be on a pant leg. Who ever heard of that ? 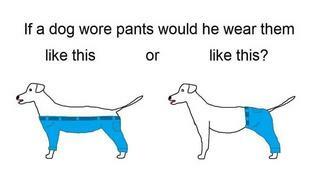 The dog would definitely wear the pants on the right. Definitely. The second one, obviously. Otherwise there is no need for sleeves on the shirt.